By Stephanie Gretchen Burgevin. Stephanie is a writer and retreat leader. She is an associate faculty member of Shalem and a graduate of theirLeading Contemplative Prayer Groups and Retreats Program and leads spiritual and secular programs. Stephanie manages Shalem’s blog and is one of the social media coordinators for the Shalem Institute Facebook page. Index cards, lined books, sketch books, random sheets of paper…they all work. Journaling takes as many different forms as there are human beings. A simple daily list of events; a record of experiences, ideas, and feelings; a collection of poetry and drawings; artwork of all sorts. It can be public or private and a way to tell one’s story. I think what perplexes many people about journaling and makes them hesitant is that there are very few rules. Perhaps the only one being that it is a visual collection in your life. When we have ordered steps we know just what to do, but here, anything is acceptable. For me, it has been an outlet. I think I was about 11 or 12 when I started my first journal, which was on index cards! I think I was still “coloring inside the lines” and not really wanting to! Through the years, there’s been a sensual bliss I feel every time I open a new journal. All those empty pages just waiting for me! Deliciously expectant, welcoming, open. I’ve drawn, written poetry, created collages, documented dreams, just kept a daily log of happenings. I’ve kept my journal on the computer at times when my hand couldn’t get down my heart’s cries fast enough. But always, it’s been a place, an outlet where my heart could open and God waited for me. Journaling is a spiritual practice that is a bit like breathing and walking meditation. You don’t need much to do it. Just some intention and something to write or draw on. You could begin with a prayer for an open heart. Then, dive in. There are no rules and there is no way to do it wrong, so no judgment or fear need be involved. It’s just you and God. As God bears witness, it is my breath, my blood, my tears that beat from those pages. Throughout my life I have been drawn to journaling. It was more of a start and stop method. When I read my previous thoughts the internal “judge” would condemn me. Years later, the journal has become just me – I am learning to accept and love myself as I am. Thanks be to GOD! What a wonderful and welcome article!! This is me! This is what I’ve done all my life! I have criticize my style much of the time, thinking I should “do it the right way” or not call it journaling. In essence, you have given me permission to give myself permission to do as I am led and know that God delights in me and my style of self-expression and self-exploration, and deep prayer connection! Thanks so much for this! Loved this! As others have said, “this is me”. 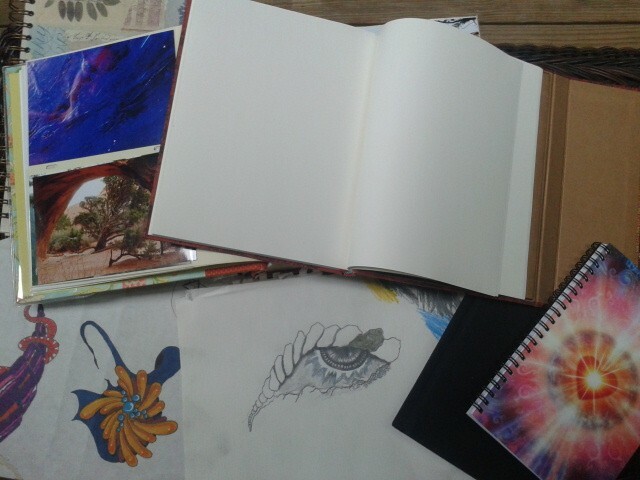 I’ve been drawn to those empty pages, new journals, a new year, new beginnings to write down since I was a young girl. So, why is it such a hard discipline to follow??? Loooooove this. Can so relate to the “sensual bliss” of opening a new journal!!! I’m so glad you wrote this and that I got to see it! So glad you enjoyed it! Blessings.